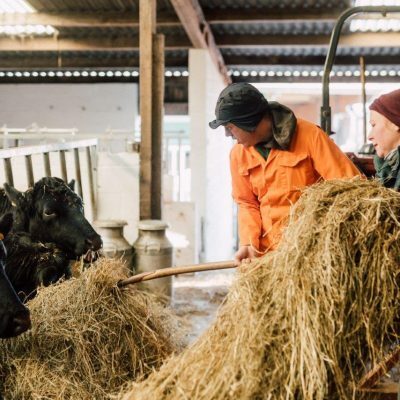 Our pilot project at Botton in North Yorkshire has combined our established knowledge and experience of social farming with a new “Farmhouse day support” model that is transforming support to older people in the local area by providing both structured and informal therapeutic activities that connect to people’s own experiences and lives. The approach is very much based on supporting the wider family and creating a range of activities that have meaning and relevance to each person. Supportive participation in the farmhouse and on the land, working with animals, and growing crops delivers a care and support model that has real purpose and outcomes. Within its early stages the project delivered tangible outcomes for people and their families, with reduced levels of anxiety, stress and restlessness. An expanded range of related and integrated support activities is now being developed, including cinema, theatre and music programmes and the charity will look to expand this support model nationally. Social Farming promotes improved mental and physical health, through working on the land. The benefits of helping out on a working farm with animals and crops are many. From improved sleep to social opportunities and increased independence. Find out more about Camphill Village Trust Social Farms and Gardens. Our monthly Dementia Friendly Cinema is an interactive experience where people are encouraged to participate with props and join in. Therefore, our cinema is a safe environment. It’s not as dark or as loud as a regular cinema and there’s no need to remain quiet. In fact, the more interaction, the better! The Farmhouse Kitchen Project is a friendly ‘home from home’ where those living with dementia and their carers have access to meaningful activities. For example baking, housework, crafts and reminiscence sessions. These familiar tasks all help to prompt memories. We work in partnership with Dementia Adventure. They provide training to our staff team, so we can continue to offer high-quality, person-centred support.